Two things are happening today. It's opening day of the baseball season and you get a new blog entry! I've been away for a bit visiting another indie down in Florida so watch for that blog entry in the coming week. As I slowly get the hang of this and post these closer to my visits, they should improve and will also include a few more pictures. I'm almost synchronized. But for now, some info about McNally-Jackson Books in New York City. I visited MJ last fall when I visited many indies in the NYC area. Unfortunately, Sarah McNally was not in on the day of my visit but I did get the pleasure of meeting a fine staff member, Brook Stephenson. Without exception, everyone I meet in these indies is fantastic to talk to and when they find out about my project of touring all the indies in My Bookstore, their enthusiasm always increases. Brook showed me all around the main floor and was great about showing me some favorite books to add to my "waiting to be read" pile. The one that I bought that he highly recommended was The Octopus, by Frank Norris, originally published in 1901. Never heard of it but it does have some acclaim. I'm a little nervous about it but Brook said it was one of his favorites so it's in the aforementioned pile waiting its turn. Two levels of books here, lots of light, and a cafe which I absolutely love. Looked like a great inventory to me, including many local authors, and also looked like something for everyone. Also, if you want to publish a book you've written this place can help you. It looked to me like they have the capability to do it right in the store. I don't always check out the websites of these indies because that isn't my primary focus but I did check this one out. From what I could tell, this place looks to have a lot of flexibility in what it offers in events, services, etc. Check it out as well. This place is 5 stars all the way! Lastly, if (I mean WHEN!) you do make it to this store, check out the sign in the restroom from Sarah. I won't tell you what it is or post the picture of it, but it is certainly unique to restrooms of indie bookstores. Now go to an indie and buy a book. Bonsoir! JUST FINISHED: Fall of Giants, Ken Follett. Loved it. WWI historical fiction. Dragged a bit toward the end but overall super. 4 stars. CURRENTLY READING: A Land Remembered, Patrick D. Smith. Mark Twain-ish but set in Florida. RECENTLY PURCHASED: Triggerfish Twist, Ken Dorsey. Dorsey is a Florida native. I was just in Florida. Do the math. Devil In The Grove, Gilbert King. Non-fiction. Florida civil rights story. Both of these look good but who knows when I'll get to them! WORD was one of the independent bookstores I toured this past fall on my tour in the NYC area. It is located in the Greenpoint neighborhood of Brooklyn. If The Strand Book Store in New York was the amazon (what am I thinking? poor choice of words!) largest of indies I've visited, WORD would be the smallest. A very neighborhood feel kind of place. As time goes on, my goal of meeting all the owners mentioned in My Bookstore becomes more and more challenging. With the passing of time ownership changes hands, lives change, and the people I'm looking for are no longer with their bookstores. Such is the case with WORD where I didn't get to meet Christine Onorati because she is no longer there. The trade-off was that I got to meet the new owner of this fine store, Emily P. I told the employee at the front desk why I was there, where I was from, and he went to the back to see if Emily could come out. Remember, this place was small so I could vaguely overhear him making his request to Emily and then I heard this loud unintelligible but obviously happy reaction from Emily and out she came. As it turns out, she was originally from Des Moines, IA, went to school in Iowa at Grinnell College and with that commonality, the conversation took off. As for the store itself, very small, no cafe, but very warm and welcoming. And as with all my other indie visits, there are always great people like Emily to talk to about books. Her recommendation to me was Five Days At Memorial, by Sheri Fink. Story about a hospital in New Orleans in the aftermath of Katrina. It really sounds like a great book. As with many others, it patiently awaits its turn to be read. I also bought The Astral, by Kate Christensen. Kate is the author who wrote the essay about WORD for My Bookstore. I took it as a sign when I walked by The Astral, a large oldish and rose colored apartment building, on my way to WORD. As always, go to an indie and buy a book. Bonsoir! CURRENTLY READING: The Fall of Giants, Ken Follett. I really like Follett so think this will be good. But it's a big boy, would make a great doorstop. For a vault door at a bank! JUST FINISHED: Turtle Diary, Russell Hoban. For me it was good, not great. Liked the story but too many tangents. 2.5 stars. Huge. Frickin huge. Four floors of books, and the main level has them on shelves from floor to ceiling. Imagine the thrill to a book lover to walk in and see this vision. Probably the equivalent of a candy lover walking into Willy Wonka land. I absolutely loved this place despite its massiveness. By far the largest independent bookstore I've visited to this point. The trade off for this incredible size is that it loses a bit of the intimacy that most indies have as part of their character. I was ok with that this time. In addition to all the books they also sell various souvenirs, also more then I've seen at any other indie so far. Also, one floor devoted to vintage and collectables (read: expensive!). Because it is so huge they have employees everywhere, a huge staff. They also employ a security guard at the front entrance. Fred Bass is the president here (not manager, president!) and I had my pick of the multiple employees to ask if I could see him to tell him about my project and ask him to sign my book, My Bookstore. I went up to a group of three employees and asked if I could see Fred. The three exchanged looks and hushed whispers. "Fred? Is Fred here? Oh, I don't know. This is highly irregular. Oh, Fred is a busy man. Well, I just don't know sir." Nobody sees the great and powerful Oz, nobody no way no how. So, I played my trump card when visiting distant indies, "I came all the way from Iowa just to see Fred and have him sign my book." Ka-ching. You may see the great and powerful Oz. Fred was in the back of the store, seated in the middle of a very long table surrounded by multiple staff members. He looked to be sorting through arrivals of used books. Of course, he was very nice, very gracious. Signed my book and wished me luck in my quest. One of the fun things about visiting all these bookstores is seeing the books they have on display to the public. Every bookstore is different in what they display which is one of the things that makes the visits so interesting. Since it was difficult here to really talk to Fred or anyone else about some recommendations I just picked out one that they had displayed. Bobby's Book, by Emily Haas Davidson as told to her by Bob Powers. I picked it out because it looked like a distinctive New York book about a guy born in Brooklyn in 1942 and running the streets in a gang. Haven't read it yet but it looks like it will be good. No coffee shop but in NYC you can throw a rock and hit one without trying. 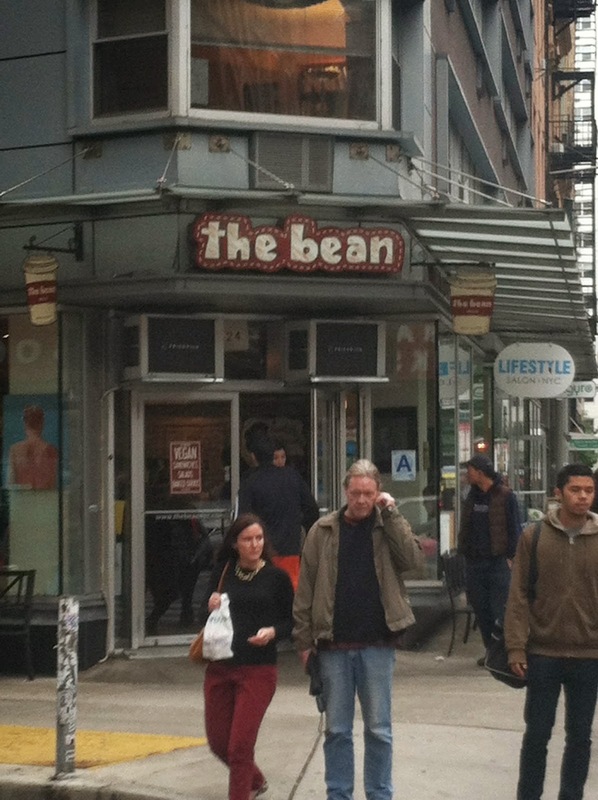 There was one right across the street called The Bean. Great place, small and crowded. The Strand? 5 stars all the way! Go to an indie and buy a book. Bonsoir! See the 18? This place is nicknamed "18 miles of books!" The Bean is right across the street. Great place! I've mentioned in previous blog posts the many special people I've met in the various bookshops so far. It doesn't matter whether they were the owner, manager, or store employee, I just haven't had a bad experience. Once we get past the introductions, the explanation of my project, and my goal things warm up just as if I'm visiting old friends. There is really something to be said for these indie store people and they all have that passion for the printed word, the printed book. This was one of those places. When my mom and I arrived this past summer, Becky Anderson wasn't in but they had an employee, Doris (her autograph on my Anderson's page isn't clear enough to know the last name), who proceeded to impart her vast knowledge and recommendations for our next books to read. I told her in an email after our visit that if every bookstore has employees like her that we'd never get everything read that they recommend! Doris's real love is mysteries. Her recommendation that I bought was The Cold Dish, by Craig Johnson. It says that it is the first novel in the Walt Longmire Mystery Series. I haven't read this yet and am not familiar with the series or this book. Don't know a thing about it. But by God, Doris sold me on it and I bought it (as all of YOU should do when you visit an indie!) and it now has a place with so many others in the "pile of books waiting their turn." She gave us many more recommendations besides mysteries and it was great talking to her. Doris is the picture of a great and gracious ambassador for independent bookstores. How about the store itself? Awesome. 5 stars. All on one level but very expansive and roomy. Lots of inventory and plenty of room to move around. Looked like they had a great kids section. Ample parking in a side lot as well as on the street. No coffee shop but there is a Starbucks very close that is a super place to sit, sip, read, and hook to wifi. And if you don't have a device to hook to wifi there is a great Apple store right across the street from Anderson's. Now, go to an indie and buy a book. Bonsoir! CURRENTLY READING: Turtle Diary, Russell Hoban. I like the premise for the plot but it seems like the author gets off on tangents. COMING UP SOON: Ken Follett. I'll share the title in the next post. Probably. I've read his stuff before and like it. I've mentioned that every independent bookstore I've toured so far has been extremely welcoming and very enthusiastic about my endeavor of touring every indie featured in the book, My Bookstore. Roberta Rubin shook the welcome tree and took the enthusiasm meter to new heights! This was our second indie visited this past summer and the welcome was out of this world. Roberta treated my mom and me like rock stars! Roberta wanted to hear all about my project, she took our picture for their newsletter (which is a must for those readers in the Chicagoland area; great newsletter! ), and even gave me a free book, The End of Your Life Book Club, by Will Schwalbe (as a side note, this book was a great recommendation. It also lists MANY more highly recommended books that you can consider purchasing on your next visit to an indie bookstore). When we visited, The Book Stall was in the process of changing hands as Roberta was stepping down and Stephanie Hochschild was taking over Roberta's position. It was obvious when visiting that not only is Roberta knowledgeable but a very beloved member of the community. Congrats Roberta! What a great indie bookstore though. Spacious, great inventory, attached to a Caribou Coffeeshop and a very community feel to this indie located in a neat part of Winnetka. You can tell by the newsletter and the local patrons that there is a high involvement for this store in the community and is the host of many events. Go to an indie and buy a book. Bonsoir! CURRENTLY READING: Turtle Diary, Russell Hoban. Just started, looks promising. JUST FINISHED: The Naked and The Dead, Norman Mailer. WWII fiction. Meh. Gets some great review as a WWII classic so there are many who like it, just not me. 2 stars. ALSO JUST FINISHED: The Racketeer, John Grisham. The high-brow bibliophiles might frown about Grisham but hey, I like him. And I needed something to cleanse my palate after the Norman Mailer. Typical Grisham. The dude can spin a story. 4 stars. This was the first on the tour. You know how you always remember that first girl friend (or boy friend, or whatever?)? This was the first indie visited from the book, My Bookstore. I wasn't sure where or how to start my tour so I gave my mom the book and told her to look through it and pick out some bookstores she might like to visit. Naturally, I was hopeful that she might think outside the box. Seattle, Portland, Denver, California, Florida. Not to be. 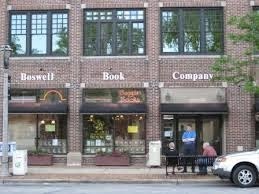 It was going to be a driving tour of a few here in the midwest beginning with Boswell's and then moving on to Anderson's in Naperville and The Book Stall in Winnetka. But more about those in future posts. Boswell's was a great place for our first visit. 5 stars all the way. The owner Daniel Goldin was knowledgeable and welcoming in every way. As part of my indie tour I'm having every owner (or highest ranking official present at my visit!) sign my copy of My Bookstore on their respective page. Daniel signed that he was happy to be the first in my book and referred to my project as bookstore bingo! Very nice! All of these indie owners always have book recommendations that I'm always curious to hear about and Daniel was no different. One of his recommendations was Beautiful Ruins, by Jess Walter. Haven't read it yet but I know it does get many great reviews. And since part of the reason of my indie bookstore tour is to support them I buy a book. Or two. Maybe three. And my pile of unread books has actually morphed into more than one pile. Boswell's is located near the UW-Milwaukee campus. Always a plus to be located near a college campus. The main floor is spacious and the inventory is expansive. There is also a very nice Starbucks attached so you can hang out there to sip a latte, use the wi-fi, and read something that you just bought from Boswell's! Go to an indie and buy a book. Bonsoir! CURRENTLY READING: The Naked and The Dead, Norman Mailer. WWII historical fiction. It's long! BOOK OF NOTE: The Lottery, Patricia Wood. Outstanding, 5 stars! If I could force this one into your grubbly little paws I would!